Tommy Daras saw the Confederate flag when he moved to Orangeburg, but it was the brick bungalow at the busy intersection that first caught his eye. He thought the site on John C. Calhoun Drive was the perfect spot for an ice cream shop. 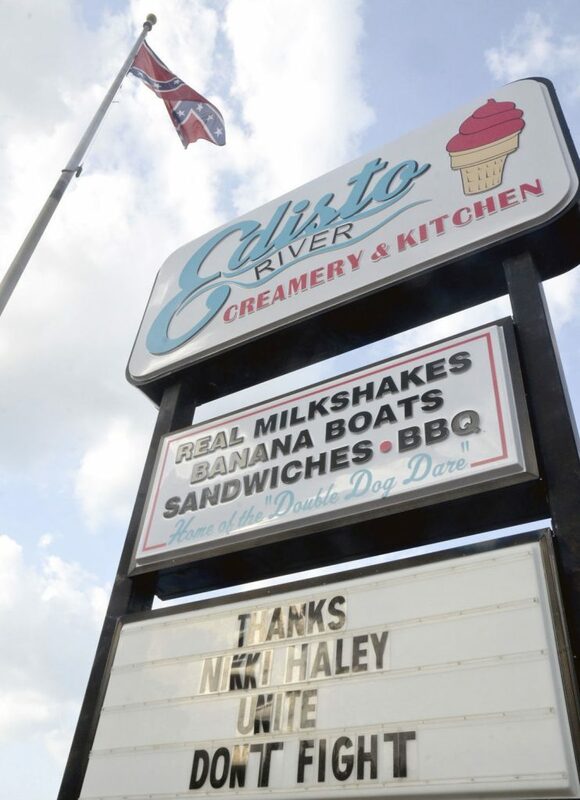 Edisto River Creamery and Kitchen wanted to take down the Confederate battle flag in front of the business. And for his first few months in business, he mostly ignored the Confederate battle flag flying on the corner of the property. Just a few weeks ago, though, the battle over the battle flag prompted him to close his business. After years of fighting over a .003-acre plot set up next to his property solely to fly the rebel banner, Daras is walking away. The ice cream shop closed Jan. 16, marking the end of a cultural and political saga that has unfurled in front of his business for the past four years. The flag plot is owned by the Sons of Confederate Veterans Rivers Bridge Camp No. 842. The land, roughly the size of a master bathroom, was deeded to the Confederate heritage group by the late Maurice Bessinger, a South Carolina barbecue baron and known white supremacist. Daras tried to co-exist but still grumbles about the city turning down his idea to build a 25-foot long “freedom wall” to separate his business from the flag. He fumes about the years he spent dealing with screaming customers who demanded he take down a flag he could not touch. The business is for sale. Those who defend the flag are unrepentant. “In 1860, Southerners didn’t want a war — they just wanted to be left alone. And that’s why today in 2019, we won’t bother you down there at that intersection if you don’t bother us,” said Buzz Braxton, the keeper of the flag and a local SCV member. The embattled rebel emblem became a symbol of national derision after photos surfaced online showing Dylann Roof, the self-avowed white supremacist, holding a Confederate flag before he shot and killed nine black parishioners at Charleston’s Mother Emanuel Church. That upsets Braxton, who said the meaning of the flag has been twisted. For him, the flag is how he honors his ancestors who fought in the Civil War. “After the tragic events in Charleston — and they were tragic — all of a sudden, it went from nine dead people to one flag,” Braxton said. To Braxton, the outcry over the Confederate flag is misplaced and should instead be directed toward the shooting itself. He also questioned the authenticity of the photos of Roof with the flag and suggested they could have been digitally altered. Braxton said the public anger about the flag just made him want to defend it more. That’s when he said he came up with the idea to replace the 6-by-10 foot flag outside the Edisto River Creamery with a larger 8-by-12 foot one. “I thought that if they are going to attack it, let’s give them something to attack. Like General Nathan Bedford Forrest said, ‘Let’s charge ‘em both ways,’” Braxton said, invoking the famous words of the former Confederate general who is also credited with being the first grand wizard of the Ku Klux Klan. Daras said the meaning of the flag changed for him personally the moment he saw the larger flag go up outside his restaurant after the shooting. “They were hollering at us for history and heritage, and we respected that. And we respected what the flag meant to them at the beginning, but when they got happy with the murder of nine innocent people, that’s not heritage. That’s hate,” he said. Before it was the Edisto River Creamery, it was a Maurice’s Piggie Park, part of the barbecue restaurant chain owned by Maurice Bessinger. “For many years, whenever you would go into a Maurice’s Piggie Park, there was almost like this little shrine at the front of the restaurant, which had a lot of Confederate and pro-slavery propaganda and images,” said South Carolina barbecue historian Robert Moss. When Bessinger unsuccessfully ran for governor in 1974, his campaign literature showed him wearing a white suit while riding on a white horse. Moss said Bessinger stayed out of the spotlight for much of the ’80s and ’90s, but soon returned to the headlines. When the Confederate flag was removed from the S.C. Statehouse Dome in 2000, Bessinger responded by raising Confederate flags over all his restaurants. A few years before Bessinger’s death in 2014, he deeded the .003 acres in front of his Orangeburg restaurant to the local Sons of Confederate Veterans camp. After 2015, Daras said it has all been a blur of zoning meetings, permit fights and parking lot standoffs. He got help in disputing the flag, and is being represented for free by attorney Justin Bamberg, a Democratic member of the state House of Representatives. Bamberg argues the land that the SCV paid $11.10 in property taxes on doesn’t comply with the business zoning requirements. When the city disagreed, Daras and Bamberg appealed the ruling. They are still awaiting a ruling from a circuit court judge. For the young black attorney who grew up in nearby Bamberg County, the fight is personal. Bamberg told The Post and Courier he is considering buying the property himself as a satellite office for his law firm. “I can think of no greater transition in history there than for a young minority state representative and civil rights lawyer to own the property that his grandparents weren’t allowed to walk into or eat inside of,” Bamberg said. Daras, meanwhile, said he has no reason to stay in Orangeburg. He’s closing on his house in the coming days, and said he and his wife will be moving back to southern Maryland to be closer to family. “There’s no unity down here at all,” he said of Orangeburg. Braxton, the flag keeper, said he will never stop fighting — no matter what.